That’s one of the most remarkable and surprising sights I have ever traveled to. 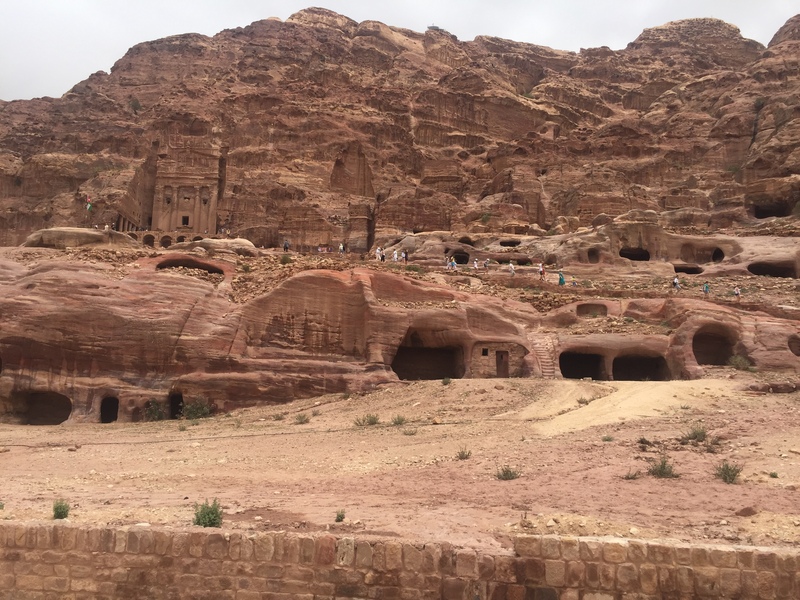 The ancient city of Petra, Jordan, known as Nabataeans’ Kingdom capital is a 2000 year old habitat, a mystical place, full of secrets, meant to fascinate, enchant and hypnotise. Yes, I am biased, but you would become biased too, just stepping into these surreal red-rose lands, stretched between the mountain and the desert. 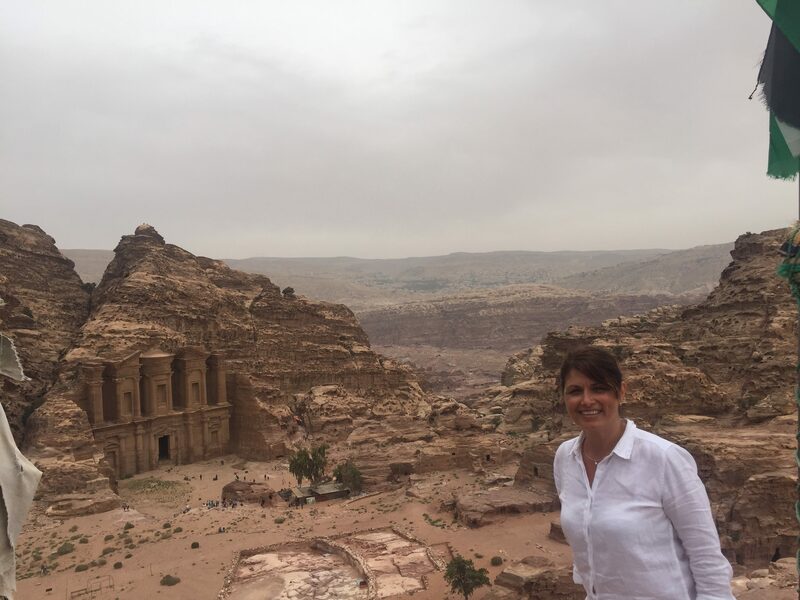 I can guarantee, a trip to Petra, Jordan would teach you humility, at the same time will provide you joy and pride, sharing this enigma spot with thousands of others, curious and thrilled to explore underneath Petra’s surface. In Petra the light is different. It changes non-stop and makes you feel as Alice in Wonderland. Everything here amazes – unearthly colours, sudden breeze in the middle of nowhere, timeless carvings, precise masterpieces, mysteriously looking Bedouins, weird sounds, stunning bird eye views…No doubt, it’s a land with own spirit, with a touching and energising background. I am convinced Petra must be felt, not described. It firstly gives you courage, opens your eyes, drives all senses, challenges you and then pushes you to the limit. Speaking of Petra, the first and the easiest association comes from Indiana Jones sequence. Have you already made a link to the third of the movies – “Indiana Jones and the Last Crusade”? There, Harrison Ford’s personage was searching for the holy grail in Petra, solitary portrayed by Al Khazneh – The Treasury facade. This carved into the pinkie rocks temple got its extreme popularity within the movie release. Al Khazneh is not the only carved into the rocks outstanding facility in Petra, but is the nearest accessible one. There are many and even more stunning facades on the route. By my opinion, the worthiest to see is The Monastery (Ad-Deir), which is the hardest and the most exhausting to reach on this trail. I’ll tell you more about it a bit later. I collected so many memories, photos, videos and emotions from this mystical Petra trip, that I won’t be able to share all of them in a single article. So, I’ll split my collection selectively between the current and the next essay “Petra’s secrets revelation tour”. This one will be mainly practical, about the sight, what and how to approach, what’s prohibited, what’s worth to visit and when is the best time to do it. The next one will uncover Petra’s peculiarities and its unique features, that leave you breathless, make you laugh, jump, dance and enjoy the journey. Keep reading, all comes its way. Let’s start with the timing and the seasonal frame of the trip. 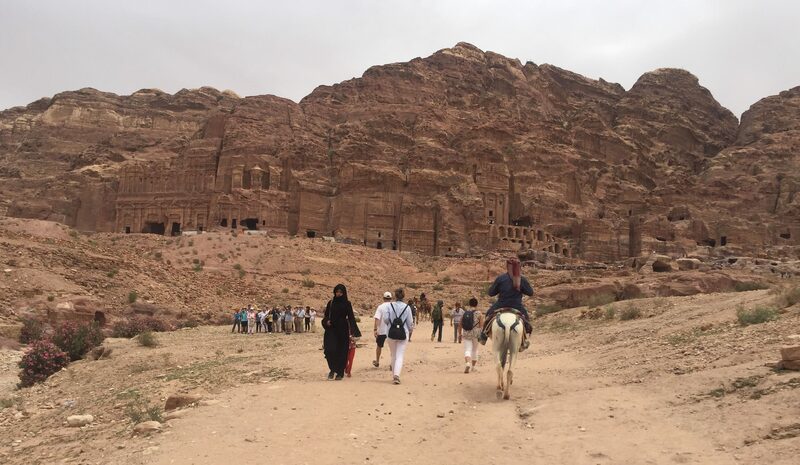 Petra is overcrowded by tourists between February 15 and June 15. It’s actually the best seasonal frame to visit Petra, in terms of friendly weather conditions. The next seasonal gap comes September 10 – November 15. During the periods above, the visitor experiences a fantastic climate, with moderate day temperatures – 22 to 28 degrees C (72 – 84 F). As a heat admirer, I would also pick July – August. It’s actually not so hot. The average daily max rates hit 35 C only (95F). But if you follow the next advice, you would skip the half of the heat and would enjoy the sight at time of the year, when it’s not crowded by tourists. Start the tour early in the morning. Get an early breakfast at the hotel and be at Petra park gate not later than 7:00 or 7:30 am. Even in July – August, the early morning temperature will be about 19 to 20 C and you can catch up with the heat. 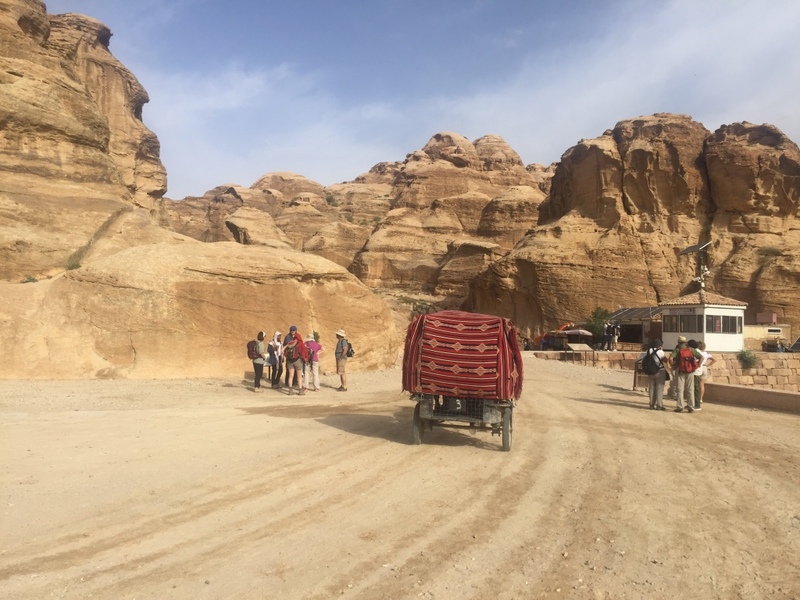 Anyway, I would recommend an early start, regardless the season, as you have ahead about 6 to 8 hour tour on foot, if the goal is to experience the most of Petra in a day trip. Now the bad news 🙂 The main route from the entrance to the top (the Monastery) and back, is 16 km (10 miles). It’s getting even worse. The last most exciting and worthiest one third of the route is quite steep and offers ancient, rock-cut steps for climbing to the top. I know, it sounds scary, but it’s such a fun and inspiration. Make sure you climb those steps in a group or at least with a companion. I promise, you would never regret it. I climbed the rocky stairs, accompanied by a lovely local lady – Rania and it was a memorable journey. Highly recommended!!! By the way, you have a choice. Those 900 steps could be conquered on foot or you can choose a lazy, alternative transportation to the top. It’s full of local “businessmen” who offer that lazy transportation on site – a donkey back ride. I grew up in a country full of goats and donkeys, so, seeing or riding a donkey, is not an attraction to me at all. But most of the Japanese, Chinese and even Australian tourists find it a big deal and passionately negotiate their donkey ride to the top. Personally, I find it really scary. I prefer to rely on my own feet, than on the potentially stumbling donkey ones. Unfortunately, I can’t advise the donkey ride possible cost, as I have never gotten interested in. Just do not forget, you are in the Middle East and everything is negotiable. So, the final price of the ride will depend on your personal negotiating skills. There are plenty of kids, between 10 and 14 year old, who would offer you their donkeys. I am sure those kids are quite capable in the business, but I am not sure how good they are in resolving a sudden, tough situation, in case something gets wrong with the donkey ride. I would recommend picking an adult to lead your donkey to the top, in case you are keen in having this type of transportation. In addition, the local authorities strictly recommend child labour not to be encouraged in any possible ways. At the entrance of the park, ask for a map. I find that map very useful. It contains a simple scheme of the park, all the sightseeing, the spots for resting and refreshments, trails guides, rules and contact information. Getting inside Petra park, right after passing the entrance doorstep, you would see lots of horse owners, offering a ride to Petra’s sightseeing. 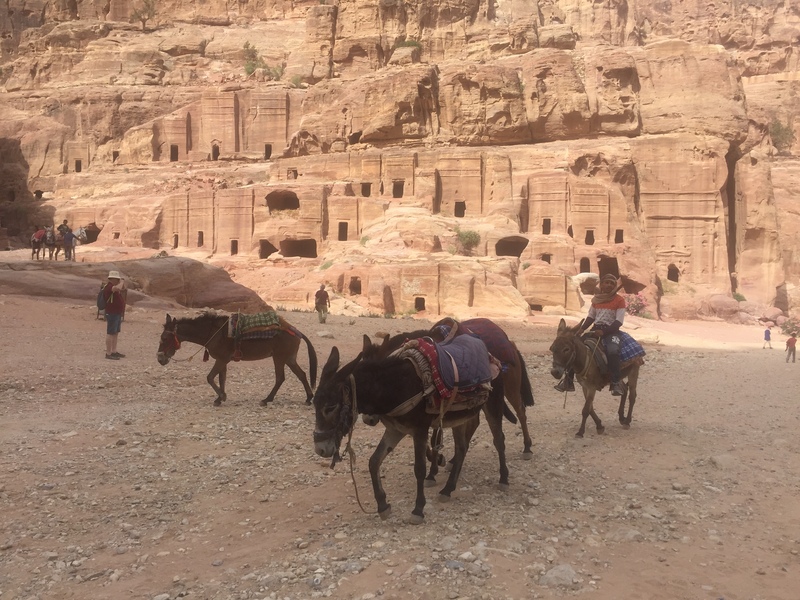 Be careful, because the horses are allowed only to The Siq (the narrow gorge, a natural splitting of the mountain), which leads the visitors into Petra. The distance you are allowed to pass on a horse back is really short (about a km), comparing with the rest of the trail. It depends on your choice, to get it or not. Do not trust the guys, who try to convince you the horse back ride is included in your entry ticket. It’s not! When the ride is over, they will ask for money anyway. I personally believe, on foot the visitor is able to see much more, to make some detours and to choose how long time to spend at each sightseeing. The other option is to pick a carriage at the entrance of the park. But the carriages are allowed only to The Treasury, which is about 3 km completely, counted from the entrance gate. And once again, I won’t find it worthy. Every tourist in the beginning of the trail is still fresh, full of power and the temperature is not that high. The horse back riding and the carriages could be hired as an attraction, in case you have never experienced it before. From the Treasury to the Qasr Al Bint a camel could be hired. The camels are allowed only in this part of the trail. This is an exotic, lazy, slow and smelly way to cross the distance. 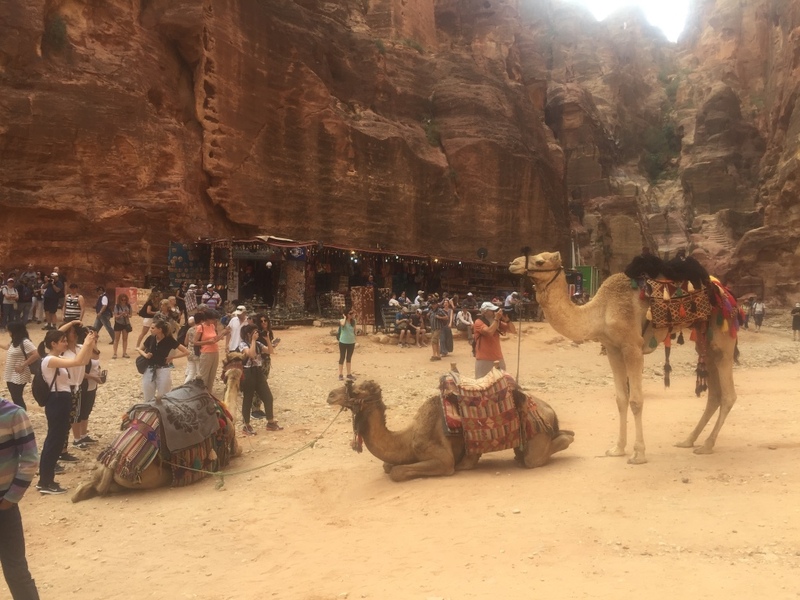 The camels in Petra are used to pose for the tourists photo shots. They are colourfully decorated and often tied in a caravan way, cleverly offered to carry a whole family or a group of visitors. Where the camel trail ends, starts the steep incline with the rock-cut steps, leading to the top of the hills and to the Monastery. The main trail could be simply divided on three parts. Which one to pick and complete, depends on your health, strength and preferences. The 1st one starts from the Entrance and ends at the Treasury. It’s the easiest, but also a very spectacular part of the route with the narrow trail in between the mountain, which suddenly reveals a marvellous view to the Treasury. The 2nd one is from the Treasury to Qasr Al Bint (The castle of the girl). It’s more less flat, very desert looking with plenty of sightseeing around. Here are the Street of the facades, High Place of Sacrifice, The Theatre, The Royal Tombs, The Nymphaeum, The colonnaded street and finally the Qasr Al Bint. At the final point there is a restaurant, to refresh and take a rest. The 3rd one and the most exhausting one is from Qasr Al-Bint to the top, where the Monastery (Ad-Deir) impresses the bravest ones. The 900 steep steps are a really big challenge, but I would still highly recommend it. On the top, you will experience another temple, much more impressive than the Treasury, called Ad-Deir, carved into the rose-red rocks. Also the most amazing view over Petra’s mountain and the valley. A fantastic resting point is built just across Ad-Deir (the Monastery), so the view toward it could be enjoyed while drinking a local mint tea or any kind of refreshment. Getting into Petra park is not free of charge. The entrance fee for foreigners is 50 JOD (Jordanian Dinars), which is almost equal to 52 British pounds, 60 Euro or 70 USD. The JOD is an expensive currency. You will see lots of kids inside the park, selling postcards or brochures for 1 JOB. Sometimes the price drops to 1USD, which is the most valuable deal on site. Whatever you negotiate in USD, will be cheaper than in JOD, Euro or GBP. The same is applicable to the trading along the route. I mean not only the horse, carriage, donkey or camel transportation, but also the souvenirs, the scarves and the refreshments along the way. Surprisingly, the skilled merchants are located along the last part of the trail, the most difficult and the most dangerous to pass through. It seems to me like those vendors actually live around the rock-cut steps, having tents and their belongings placed under. You would be pleased how good their English is and how crafty they are in selling you stuff, you actually don’t need. It’s easy to catch you, while stopping and staring, no matter if you were unable to breathe or just curious to see the stock. Getting higher, those merchants start encouraging you to keep going, as you are a hero at a marathon race. They keep updating you just 30 minutes left to the top and you hear the same alert every next 30 minutes 🙂 But at the end, when they tell you just 5 to 10 minutes left to the top, it’s almost true. I should admit, having this verbal support during the climbing is a great feeling and being encouraged helps to move easily. There are plenty of them. For example, I believe to experience the sunset in rose-red city of Petra should be an extra ordinary phenomenon, but unfortunately it’s impossible. It’s prohibited to sleep and stay overnight in the park. All the visitors must leave before the sunset, which means the trail, up and back, should be completed till 6 pm. 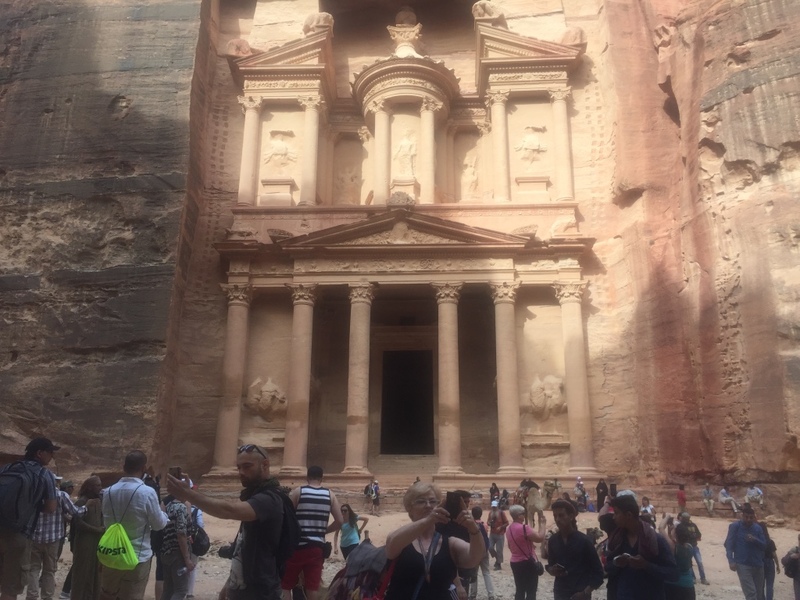 By the way, there is a night Petra tour, which is available on Monday, Wednesday and Thursday. It starts at 20:30 and lasts about two hours. This tour is mostly about atmosphere, not about the content. Going to the Treasury, the tourists are accompanied by a Bedouin flute music and some storytelling from the guide. The Treasury could be seen at night, lit up in candles. 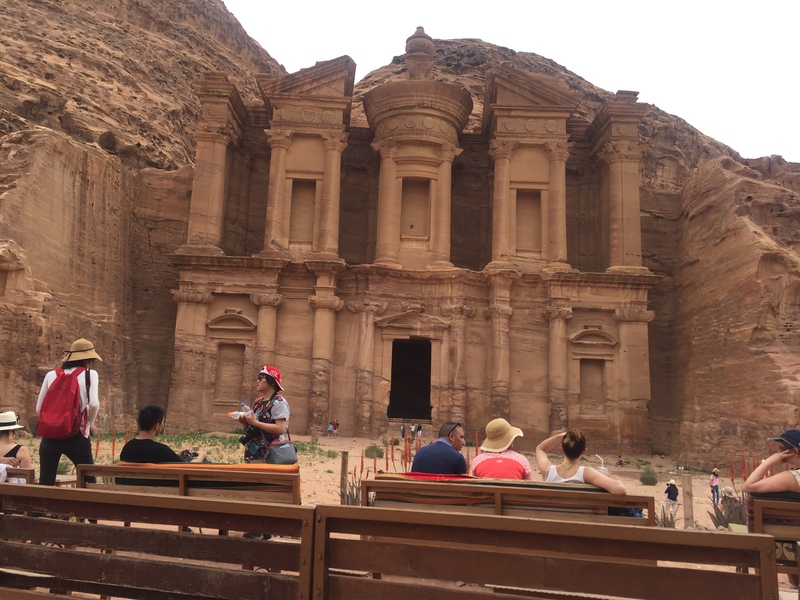 I am a bit hesitant if I should go, because the comments I heard from the visitors who experienced Petra by night tour were from disappointment to a huge excitement. I guess it depends on the particular occasion and the guide’s personality. The 2-hour night tour ticket costs about 24 USD per person and should be bought separately from the day tour ticket. Any collection of coloured stones is prohibited as well. Climbing the rocks is strictly prohibited too. Expectantly, any kind of bungee or other jumps/ flies from the top of the rocks is forbidden. The ticket is valid only for the day of issue and can’t be used for another date. But I heard there is a two day ticket, which gives more space and freedom to explore the park. To be precise, one day in Petra is not enough for discovering its secrets and peculiarities. 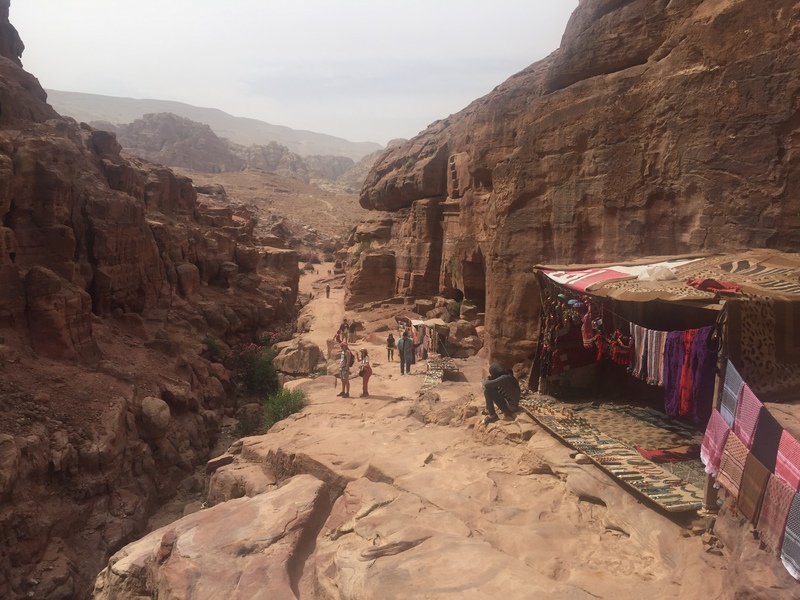 There are plenty of hotels and hostels in Petra. For the high season though, you will find all of them fully booked. 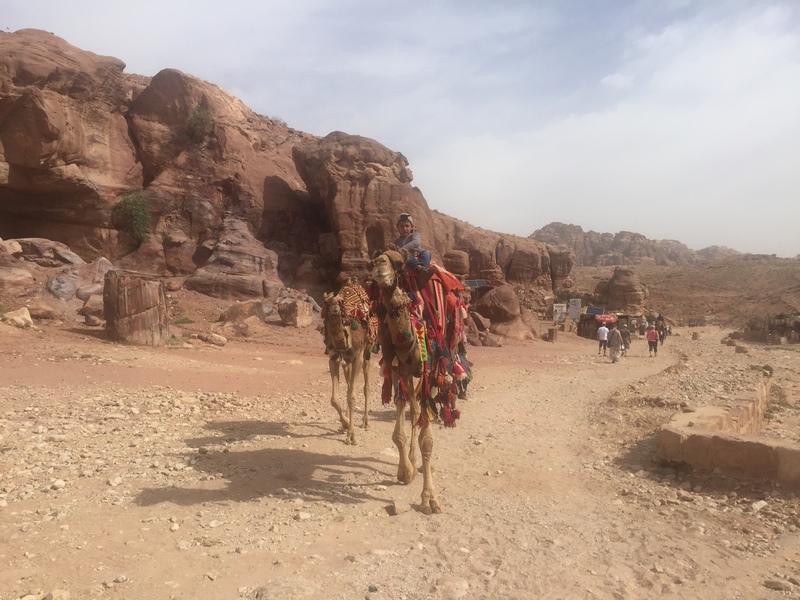 I stayed at the best one – Mövenpick Resort Petra. Its location is unbeatable, right at the gate entrance to the Petra park. It’s a 5 star hotel, with an unique spirit, very exotic, oriental and furnished in a mind blowing, completely Arabic style. The hotel’s lobbies and the restaurants look as a piece of art. The most spectacular facility of the property is not the outdoor swimming pool, but the roof top terrace, which is one of a kind. The view took my breath away. It offers more than 180 degree panorama to the Great Rift Valley and to the rose-red mountain. At the same time, quietly and peacefully provides a stunning view to the desert sunset. The breakfast and the lunch were delicious, classy and prodigal, especially in the Mediterranean restaurant, where you feel as a character of “1001 nights” fairy-tale. Highly recommended!!! 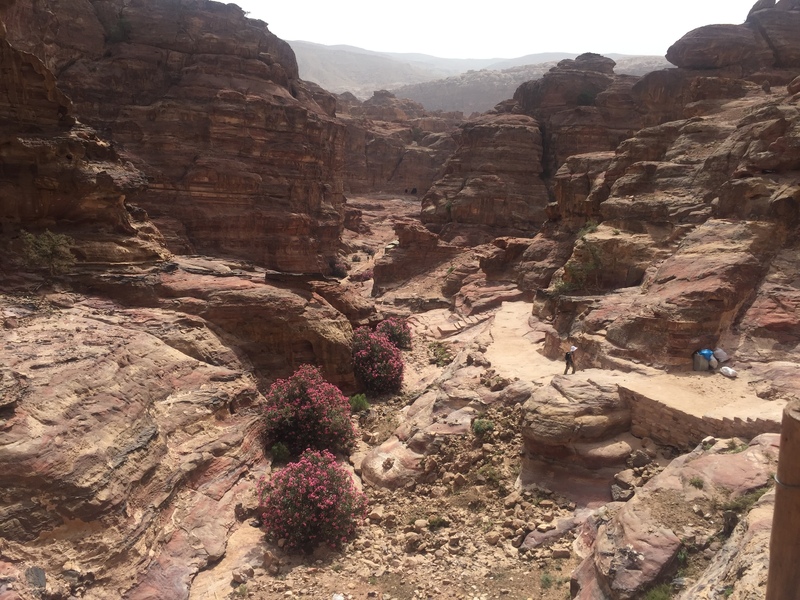 All you can do in Petra is to enjoy the surroundings. Lots of room for walking. Perfect place to buy your memory souvenirs from the trip to Jordan. Some time could be spent around the swimming pool, pleasantly sunbathing. Petra is an amazing place to take photos and to improve your photographic skills. It’s a very romantic spot, especially at night, for couples, possible engagements and bride to be. Lately, it has become a desired and quite famous exotic place for weddings, team buildings, any kind of social and corporate events, also business meetings, which require privacy. Keep it as light as you can. I mean both, weight and colours. The best way to dress up – loose trousers, long sleeve shirt (to prevent the sunburn) and sneakers. Avoid the black colour for clothing. The long trail requires sunglasses, hats or scarves, a sunscreen is mandatory. A small backpack with drinks, some snacks, wet wipes and tissues is enough. Do not forget your passport, as you will be required to show it at the entrance (for buying a ticket). Also some cash, preferably in USD or JOD, in case you want to buy souvenirs. I saw tourists, armed with hiking/trekking poles, for overcoming the steep steps easier, but it’s not such an issue. Also some visitors were hiding themselves from the sun under umbrellas, especially the Asian ones. I personally find it uncomfortable, holding an umbrella during the trail. Sometimes you would need your free hands to help climbing. Photo cameras are strictly desirable, at least the cell phone ones. To miss a shot over those stunning views and sights is nearly a sin. I believe, after the broad information above, most of you are ready to visit Petra, Jordan. It’s a must see sight, one of those you should not miss during your life, one of the last world ancient wonders, worth to be experienced. 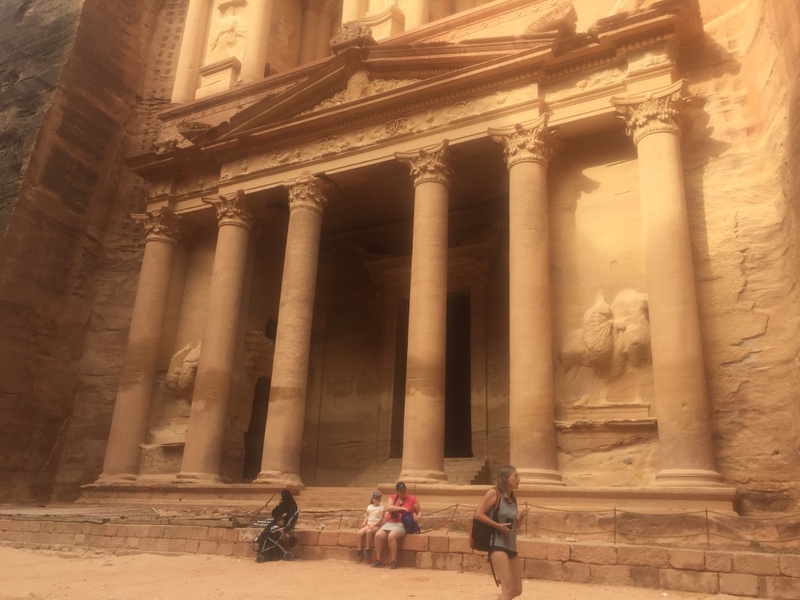 So, I think, it’s really time Petra, Jordan to be added to every travel bucket list. Also it’s time to start preparing a trip to. 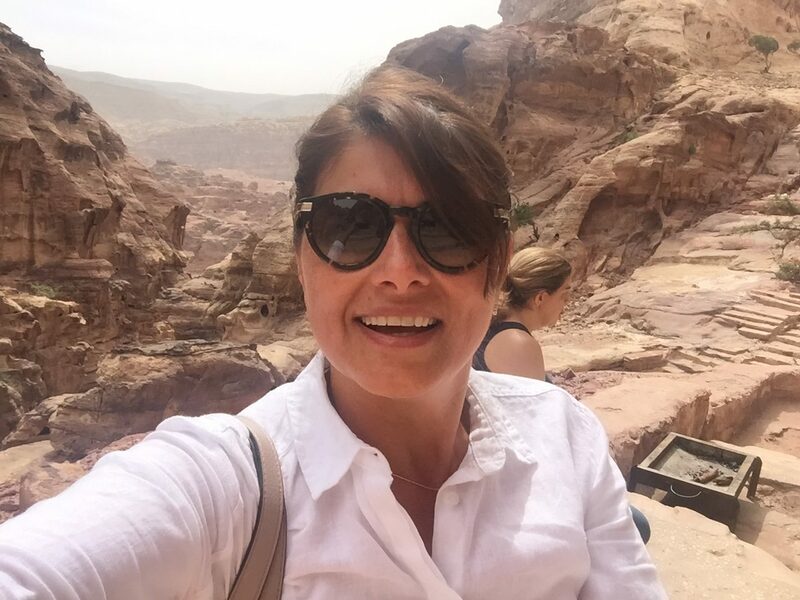 In my next article “Petra’s secrets revelation tour” I’ll share more about all the surprising and funny events, I faced and all the weird people I met, during my wonder trip to Petra, Jordan.